Time and $$$ saving items and I thought I would share them with you. I will add to this over time as I think of other items that have been useful to us. Have you every considered putting in a dashcam? Interestingly enough, in many countries they have become quite commonplace. In the US, they have been slow to catch on, but in a collision, dashcam footage could make all the difference in determining responsibility. A dashcam is one of those items that fits into the “I’d rather have it and not need it than need it and not have it” category. There are several characteristics that determine dashcam price and value to you, the driver. You do want a camera with both battery and USB power. You need to determine if you want it to record when the car is parked, as this will help you catch the people that slam into your car in the parking lot and then take off (if they hit you from the front). The more expensive cameras have a lot of options you probably don’t need. GPS and WiFi are luxuries that don’t necessarily offer a lot of benefit and for that reason I have selected this model. It includes a 32 GB memory card and you can replace that with a larger one if you find that necessary. This model has WDR for Wide Dynamic Range (better low light sensitivity) and has generally very good ratings among those who have purchased it. It also has a great warranty from the manufacturer. I liked the mount and the monitor screen option. This way you can go through the footage on the spot rather than transferring the data to a computer for review later. It’s a really good deal for only $79.99. I attend a lot of business networking meetings. A readable name plate / badge / card for your lapel or shirt is fairly important. Many years ago I had one that was great, but it is really old technology and requires an older Windows platform and a serial port. I have neither. 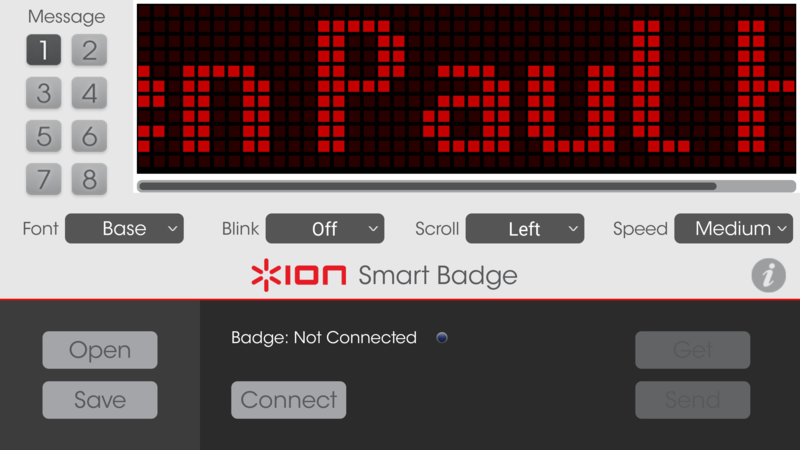 So after much research and reading of reviews I decided on the ION Smart Badge. It scrolls whatever message you program in and select. It has 3 fonts, 3 speeds and is rechargeable. Pin it to your shirt or use the magnetic attachment. This is a great conversation starter. It has 8 memory locations for you to store messages in. It is very simple to program, connects to the phone via bluetooth, so you can update your message on the fly. Very easy to use. I went shopping at my favorite location and found this baby. It absolutely rocks (literally). It will support your artwork from vertical to horizontal and every angle in between with adjustable height and 3 different stop blocks. It will handle very large pieces. It rolls on casters and all 4 casters have locks so you can hold it in place. The storage drawer in the bottom is really handy and it takes all of 15 minutes to unpack and assemble. It comes with the base assembled except for screwing in the casters (16 screws – supplied) and switching the knob around ( for shipping purposes the knob is on the inside of the drawer when it arrives). The vertical supports require minor assembly and attachment to the base. Then the table assembly is attached to the vertical supports. It comes with all the hardware and tools you need to complete the assembly. I will warn you it’s a little heavy and the whole thing (two cartons) is packed into one large box. It is a heck of a deal at under $200, really well made and very configurable. I highly recommend this easel. 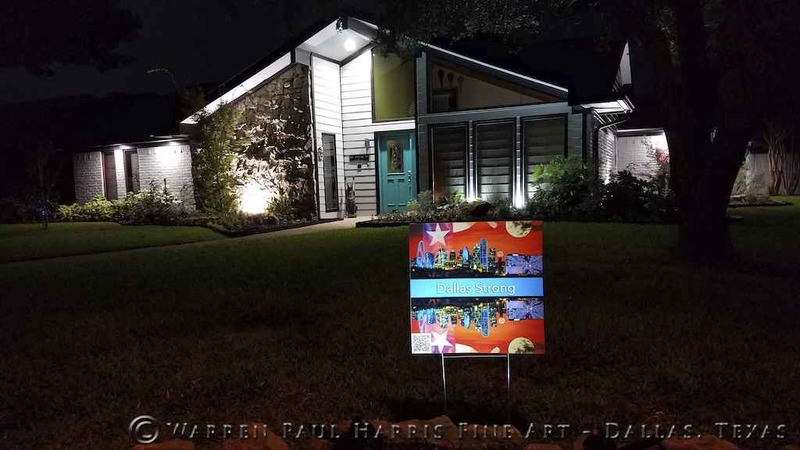 Blue ribbon has been very popular here in Dallas since the July 7th killing of Lorne Ahrens, Michael Krol, Michael J. Smith, Brent Thompson and Patrick Zamarripa. Others were wounded in this cowardly, heinous attack on our police officers who were protecting the Dallas citizens who were protesting in the streets. A neighbor had given us some “ribbon” they had left over, but it was a type of mesh that was not only invisible (well, mostly invisible) but disintegrated after only a few weeks. It seems most of our neighbors are using blue plastic tablecloth material, which looks fine, but I wanted something more formal and spent a little time researching until I came upon the perfect item. Grand Opening Ceremony ribbon is what you see used for ribbon cuttings with a giant scissors. It is made of satin and is six inches wide. It looks great and comes in a 25 yard roll. I have to say it was exactly what I wanted and I have a link for y’all if you’d like the same effect. Home burglaries in our area are on the rise. A common technique for breaking into your home is for thieves to break into your car first, and steal your garage door remote. Then they wait until your car is gone, open the garage door and take everything they want from your home while you are away. If you don’t have an alarm system, GET ONE – and USE IT. Lock the door from your garage to the house and put a key for this door on a key ring stashed someplace discreetly in the garage so you can’t lock yourself out. Put the garage door remote that clips to your visor in a drawer someplace in the house in case you ever need it. Buy a keyfob remote for the garage door opener that will always be on your keychain – and therefore, always with you. Put your vehicle registration papers in your purse, wallet, or better yet, photograph them with your phone and file them safely away at home. NEVER keep these in your car. It’s an easy way to get your address. This is what we have done recently just for this purpose. Here is the one we have and it’s a better deal from Amazon than the local hardware stores. I also recommend installing the Skylink Wireless Garage Door Monitor. We put this in shortly after going to the keyfob opener to alert us when the garage door is open. It’s about a 5 minute install and beeps continuously to let you know the door is open. This is absolutely invaluable. If you are like us – and some of our neighbors, you have occasionally left the garage door open for extended periods of time. Thieves are opportunistic and always looking for this situation. This is a very inexpensive and easily implemented solution. In addition to the garage door monitor, Skylink makes a motion detector to alert you to activity around your house or in your driveway. Add this device to the above and you have improved security. It’s easy to set up and configure. The receiver supplied with the kit above will support up to 4 individual sensors. We have this one in our carport to alert us to tampering. If you don’t have the full Skylink kit – or don’t want the garage door monitor, you can get the motion detector with receiver in a kit for only a few dollars more. Let me add a couple of other recommendations for home security while I’m at it. Burglars work day and night. At night, they prefer to work in the DARK. Therefore, if you light up the exterior of your home like DAYLIGHT, they will move on to someplace less bright to do their dirty work. Keep your porch lights on. Put in the brightest LED bulbs you can find. Light up your driveway / carport with the brightest LED fixtures you can find. I have several of these installed. I have bypassed the motion detectors for the ones in our carport so they are always on. You could do surgery in our carport. If you have architectural lighting or up-lights, these are what you want. They are the equivalent of a 65 watt floodlight and are 4000k (daylight). For security, you want to get away from that warm glow we’ve all come to enjoy from our incandescent bulbs. Daylight white or even the blue-white of 5000k bulbs is a better deterrent. The brighter, the better. Most people still have 25 watt incandescent bulbs in their porch lights. The original concept was to not use any more energy than possible, and make the front porch look inviting and pretty. For today’s security demands, more light is better and white light or blue-white light is a better deterrent. You want to push light as far away from the perimeter of your home as possible. These are 100 watt equivalent bulbs that only consume 15 watts each and are 5000k blue-white light. These little weatherproof LED downlights are perfect for architectural lighting or security. They only use 9 watts of energy while producing the light output of a 65 watt floodlight. You will need 120 VAC wiring to each of these. We retrofitted our home for architectural lighting when we resided it in early 2016, putting these in all the horizontal soffits. You need something to turn your lighting on and off. A photocell is best, but you need to interrupt your wiring and place it in exactly the right location for it to work reliably. The next best choice is a timer. Honeywell makes a great timer that fits in place of a standard Decora wall switch. I’ve used these for years and they work great. This is the one I used to control our entire exterior lighting grid. I have designed and installed surveillance systems for over 30 years. My equipment is strictly commercial grade and comes from a wholesaler in Florida that I have worked with for a long time. My opinion of the do-it-yourself camera systems is that they are worth a little less than what you pay for them. These inexpensive systems make you feel good, but when the rubber meets the road they fail. Under low light conditions (like when your car is vandalized in the dark) you will have no remotely usable footage to help the authorities locate the criminals. The location of your cameras, where they are pointed and how far they are zoomed in – along with where they are focused will play a big role in gathering evidence. Overhead cameras at your doorway only help you determine the kind of hat worn by the person who just broke into your home and emptied it out. Chest level entryway cameras are mandatory if you want to be able to ID someone. You need to provide LIGHT for your cameras to work well at night. Counting on infrared is not a great solution. You cannot tell colors or even get great facial recognition with infrared. Full color with lots of light is your best choice. This is what I provide for all my installations. Cable quality is also crucial when doing these installations. The newest HD cameras require high end cabling or they simply will not work. You cannot buy cheap prefab cables for these cameras. If you do, you’ll get it all installed only to find nothing works. Then you will need to re-pull all the cable. Cable should be run through the attic. It is very time consuming and more expensive, but cannot be tampered with. Smart criminals will case your home and come in through any blind spot to cut exterior camera cables stapled up against the walls. This leaves you blind. Zika / West Nile / ChickenGonnaGitcha !!! I don’t know about everyone else, but we live at Ground Zero for all these mosquito-borne life-changing diseases in the U.S. – aka “Dallas”. I am not exaggerating when I say there are times when they attack in squadron formation. All last Winter we still had mosquitoes. December, January, yessirree. Open the door and you’re under attack. In my search for tools to defeat these airborne micro-terrorists, I finally settled on blending essential oils. I mix small quantities with rubbing alcohol and put it in a sprayer. A liberal coating before going outdoors works great for me. Karen needs a different blend, as she is at the very top of the mosquito food chain. My blend is about 1/2 oz each Lemon and Eucalyptus oils to about 2 cups of rubbing alcohol. Karen has found Tea Tree Oil to work better for her. She applies it directly (undiluted) to her exposed skin.